Get a refreshing, close yet gentle shave with the Philips AquaTouch. If you enjoy the comfort of a wet shave, with the convenience of a quick dry shave, then wet and dry AquaTouch is perfect for you. Normally retails at £160. You can view the same product at Shavers.co.uk and John Lewis at normal retail price. For one-day Amazon have reduced their price by 63%, plus they are offering a further £5 discount to take the price to £54.99. AquaTouch offers 10x more protection than a regular blade, while still giving you the closeness of a refreshing wet shave. It has a MultiPrecision blade system with rounded profile heads that glide over the contours of your face, designed to protect your skin. Using Super Lift & Cut action, the blades lift the hairs before cutting them, even the shortest stubble. The shaver heads flex in 5 directions, hugging the contours of your face and neck, delivering a close, comfortable shave, reducing the need to go over the same area again and again – resulting in less irritation with no nicks, grazes or “razor burn”. The shaver head is designed to be clicked on and off, so you can switch it to the precision trimmer attachment, ideal for trimming moustaches and side burns. Both the shaver and trimmer attachment are fully washable, so it’s easy to keep in perfect condition. The shaver is fully charged in just one hour, giving you 45 minutes of shaving time, that’s about 15 shaves. And if you ever find yourself out of charge, there’s a quick charge facility, where a 5 minute charge will give you enough power for a morning shave. Amazon are selling this men’s electric razor for less than half-price. 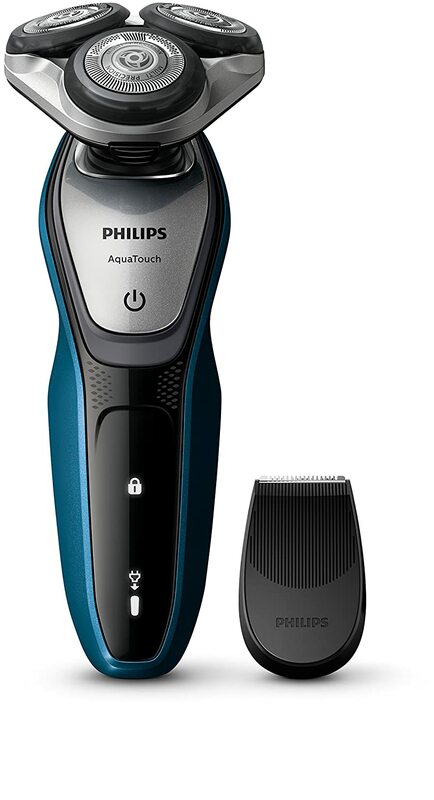 Get a refreshing, close yet gentle shave with the Philips AquaTouch. If you enjoy the comfort of a wet shave, with the convenience of a quick dry shave, then wet and dry AquaTouch is perfect for you. Add the voucher to your Shopping Basket by clicking the “Collect this Voucher” button just under the price details. The voucher is worth £5. Voucher is valid until 30th September 2015.